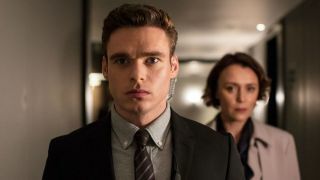 Bodyguard aired its revelatory finale on BBC One last night to thunderous acclaim from viewers and critics alike, but its departure from the weekly TV schedule has already got us asking - will we get a Bodyguard season 2? From its very first episode, the impeccably devised British crime thriller felt like a closed 'event' series without any ambition beyond its isolated collection of episodes, but the show's ending has - at least implicitly - left open the possibility for a follow up. We won't be spoiling anything here, but everybody's still talking about Richard Madden's performance as titular Bodyguard David Budd, and that character's potential as a new British hero for the modern TV era. Spoilers - What's acceptable and what definitely isn't ok? Beyond the fiction of the Bodyguard TV series itself, creator Jed Mercurio has already discussed the possibility for further seasons (yes, that's seasons plural!) of the show. Especially in light of its hit ratings, which has already broken viewing records despite being difficult to watch outside of the UK (here's how to watch Bodyguard in case you're still struggling, by the way). “It’s probably fair to say we would probably approach any thoughts of a second series with the idea that it would create an opportunity for a third or fourth,” explained Mercurio in an interview with The Sun. On Twitter, however, the showrunner has poured cold water on reports suggesting Bodyguard season 2 is officially happening (see below), and despite telling the Radio Times that he'd "absolutely" be interested in following up last night's finale, also admitted the the BBC, at the end of the day, "holds all the cards" as to whether the series returns to TV. So, the audience wants Bodyguard season 2, the showrunner wants Bodyguard season 2, and it seems like the only thing stopping that from happening right now is the BBC, who would be silly not to give it the green light given that it's the broadcaster's most popular show since Downton Abbey. In other words, I'd be very surprised if Bodyguard season 2 doesn't happen, and it's likely that we'll be hearing more about David Budd's future shortly, as the BBC has a history of commissioning new seasons soon after the first has aired on its channels. Watch this space, Bodyguard fans, the outlook seems very bright indeed. In the meantime, why not read up on the questions we have after that Bodyguard ending to find out what a second season might cover?